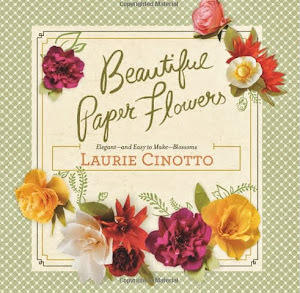 laurie cinotto art + craft: Here's Your Chance to Win a Copy of Making Paper Flowers! Here's Your Chance to Win a Copy of Making Paper Flowers! Good morning, everyone! I've got one hot-off-the-presses signed copy of my new book/kit, Making Paper Flowers , that I'll be giving away to one lucky reader! How do you enter? It's easy. Just leave a comment on this post by Friday, April 8th. On Monday, April 11th, I'll randomly select the winner, and announce it on the blog. I'll request that the winner email me with their contact info, and a I'll drop that copy right in the mail. To learn more about what's inside the book and kit, please visit HERE. I have a friend who would adore this book! I found my way over from your kitty committee blog, and have to say that even if I don't win this, I will probably be going out to find this in the bookstore soon! I would love to try making some of these flowers! I would love your book (and Linus - but I'm too far away to take him)! me me me! I would love to make paper flowers! Laurie---I'd love a copy. I've been experimenting with paper craft flowers lately, but need some new ideas. Smoochies to all the kitties, especially Miss B.
Oh my gosh I NEED this book. I can always use a pretty new book! Such a lovely book and thank you for the chance to win it! Love all that you do! How spiffy, because just last night, as I pulled up at home after a Barnes & Noble trip, I smacked my forehead for having forgotten to snag your book. Congratulations on the book, it looks fantastic! I've been strongly considering buying it and would be thrilled to win it. I would love a copy, but I want to use it as a therapy tool for some of the youth I work it. We currently use oragami and I think this would just be a great addition!! I'd love a copy! My kitty would love to chew on some lovely paper flowers. I always loved making paper flowers when I was a kid, so having a copy of your kit would be amazing! Congrats on the book; it's been on my radar to buy. It'd be even greater to win, though! So exciting! Congrats on the book, Laurie! Yippee... count me in. I'd love to have this book!! I've never made paper flowers before, but your book cover makes me want to give it a try. I'd love to win this. Always looking for more crafts to do :) I would love a copy! 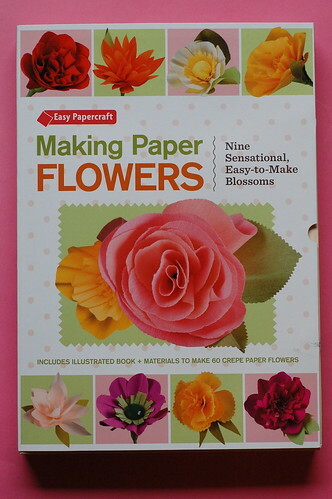 I have wanted to try making paper flowers for quite some time, but couldn't find the right book. You are so creative and the book looks amazing! Also, I am a regular follower of your IBKC blog love the kitties. I would love this book. And Kirby. Pick me pick me! I want to make some paper flowers! This would be perfect for Easter gifts!!! Would love to have this. Love IBKC and this blog too, they always make me smile. You are amazingly talented and I'd love to have an autographed copy of your book. Pick me!! Pick me!! I ordered two as gifts but would LOVE one for myself! Please enter me. I would really enjoy this book. If I don't win I'll probably buy it anyway. Love your crafts and kittens! I would love this book also! Pick me a pocket full of paper flowers. Would love to have a copy of your book. This would be a fun book! I love the Itty Bitty Kitty Committee! Count me in...congrats on the book! This is exactly what my kitties and I would love to do while I am convalescing! how do you manage to wrangle all those kitties and make such pretty flowers?! The book/kit looks awesome! Thanks for the giveaway! Congrats on the book! Would LUV to win a copy! Ooooh, I want this book. Fingers crossed that I win! Looks awesome and super fun! My best friend would adore this! Suzanne W said...I too have a friend who would enjoy this kit too. I've already purchased & recieved my special autographed copy, thank you!!! Can't wait to start. My only disappointment was that the book was published in....CHINA! Not your choice or fault, but still. Here's a contest I can't resist. I've been toying with the idea of making my own bouquet for a commitment celebration... This would come in just at the right time! So exciting! Count me in - this looks lovely! Fell in love with The Bean, then the kittens...THEN I met you in NYC at Martha's Craft Show...Bought 2 of the Christmas ornaments and a boutinnaire for me. Teal with a tiny reindeer made my holiday dress look wonderful. Thanks for sharing your crafts and cats. Love paper crafts and flowers, so this book would be perfect for me! I want to learn how to make paper flowers! This is great! I enjoy the color of flowers, but hesitate to purchase them for many reasons. I would love the book and plan to purchase it anyway. If I win, I'm sending it to my sister-in-law as a gift. Want... want so much!!! My students and I would really have fun with this!! Oh us please! I hope I win. Oh, this would be perfect for me! Congrats on the book, again! I am interested! Your paper flowers are gorgeous and I'd love to try my hand at making some. How cool this would be! Kitties and crafty books! Sign me up! pick me! pick me! I love flowers, especially ones that don't make me sneeze. Oh, Laurie, you know I'll buy your book anyway, but if I won it, I'd give that copy to someone I love. Laurie, it's my daughter's 17h birthday and she loves paper crafts. I would give this to her as a belated b-day gift. I'm in WA and am SO tempted to come get all of the Medleys. I am in love with them! Ohh...I'd like to enter too! would love to have this book/kit.. Thanks! I've been dreaming of making flowers lately! I want to win! This book is cute, the kitties are cute, everything about your life is cute! I want to make pretty flowers! Pick me! Pick me! It looks just like something that I'd like to have in my craft book collection,nso count me in! Such a great giveaway! Yes, please! Good gravy...look at all these comments! Put my name in the hat, please...I already have a copy but could use another! Looks like great fun in your colorful, classic style! The book is just beautiful...thanks for a chance to win it. No hat but I'll throw my comment in. Your book looks delightful! would love to learn how you make those beautiful flowers! 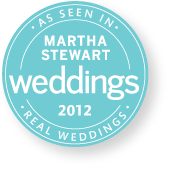 Congrats again, Laurie! A book, the Bean and adorable kittens - who could ask for more? Many will enter, only one will win. ;) Laurie you are a creative genius! I think your book looks amazing! I would love to win a copy! Our mom would love an opportunity to win your book. She is the crafty sort. Not having thumbs, since we are cats, it would be quite hard for us to craft paper flowers. I would love a copy. The flowers look amazing! I have been eying thing book since it came out! I love your flowers almost as much as I love your kittens! I am an avid IBKC follower and a crafty-wannabe. This book sounds like fun for me to learn how to make flowers and fun for my cat to play with the results! 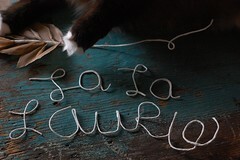 I love your kittens, and I love your crafts, and I would love this book! Love, love, lovely! I would cover my house in flowers! I would love to win. Love your cat blog! It's so lovely--and I'm sure my cats would enjoy them! Long time fan. First time commenter! Holla! I would love this little treasure! Want! I can't resist a new craft! I would love a chance to try to make these! What an ingenious and creative way to create gardens of flowers that last all year long. Ooh. La. La. Love it! What an accomplishment. Beautiful book and thanks for the opportunity to win it. I'm going to throw my name into the hat as well. I'd love to learn to make paper flowers! kittens and Crafts... a girl after my own heart! I only have copies of the old Dennison books. I'm looking forward to fresh new flower patterns! Oh how sweet to offer.....I would love a copy of your new book! And that Linus......what a looker. so happy for you that you have a book!! I've been an IBKC follower for years now, and have always loved the crafts/ flower arranging you do. OK, Everyone! No more contest entries, we'l be announcing the winner on Monday! Love the book. Looks like fun!